Obituary – Jarrett, Ronald Charles « Perry High School Alumni Association, Inc.
F.F.A. 69-71, Vo. Tech. 70-71. 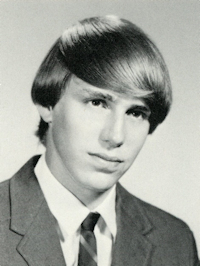 Ronnie C. Jarrett, 28, 303 Grove street, was fatally injured in a motorcycle accident on September 14, 1981. He was born Aug. 6, 1953, at Perry, the son of Mr. and Mrs. Paul Jarrett, 1311 Holly street, who are among survivors. He was a 1972 graduate of Perry high school and had been employed as an oil field roughneck. He and Janis Evans were married June 1, 1974, at Perry. He was a member of the Assembly of God church. In addition to his parents, Jarrett is survived by his wife, Janis, of the home at Billings; a son, Jason, and daughter, Fawnda, also of the home; three brothers, Larry Jarrett and Robert (Stork) Jarrett, both of Perry; and Norman, Tulare, Calif., formerly of Perry; and his maternal grandmother, Mrs. Josephine Reppert, Texas City, Texas.